Lighting is something most of us take for granted. We flick a switch and expect a light to come on. If it doesn’t, we buy a new one and change it, but have you ever thought; how much energy is your lighting actually using and how much is it costing your school to run every year? You are probably aware that one of the main contributors to your energy costs is lighting but you may be surprised to hear that with a simple funded upgrade to LED Lighting you can eliminate up to 90% of those lighting costs and never buy or replace another light bulb or fitting for the next 10+ years! The Benefits of LED Lighting in Schools can mean from thousands, to tens of thousands of pounds in savings, each and every year by immediately improving energy efficiency. There are also the health questions that arise when you really think about your existing fluorescent lighting. Did you know those gas filled tubes above your head are essentially as hot as the sun’s surface inside, and full of hazardous material such as mercury, not to mention your student’s exposure to UV light and the visible radiation emitted by fluorescent light sources. When the human visual system transmits this poor spectrum of light it must fill in the gaps to process the picture. Students who learn in these poor lighting environments will often have difficulty concentrating. Some individuals can have a sensitivity to this light (scotopic sensitivity syndrome) and can sometimes be misdiagnosed with dyslexia, learning disabilities as well as symptoms like dizziness, headaches and nausea caused by the spikes/gaps in fluorescent light output. (LED) Light Emitting Diodes are a cutting-edge solid state technology and is predicted to replace all artificial light by 2030 and with further developments, the cost of switching to LED is now widely available. 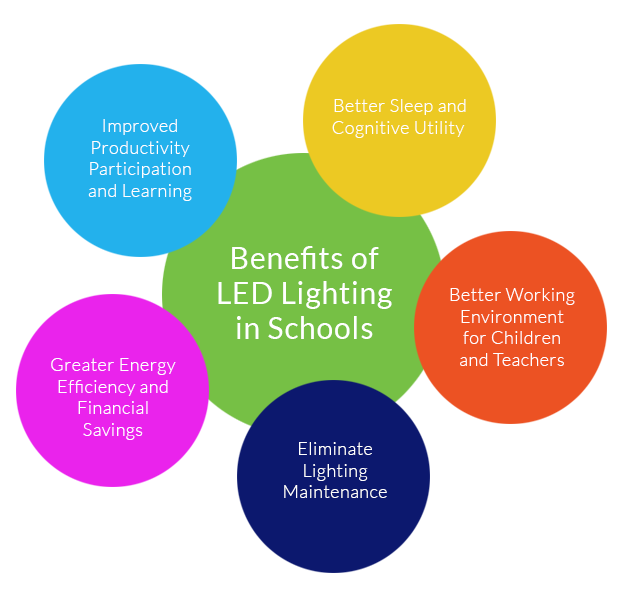 The simple switch to LED lighting not only dramatically reduces energy costs and improve energy efficiency by up to 10 times that of traditional lighting, but can provide the benefits of improving health, safety and performance in classrooms with a far superior output of quality of light. This superior lighting is especially important in aiding cognition in children and young adults. Increased Productivity – LED lighting can increase productivity participation and learning when compared to fluorescent or incandescent light bulbs. Increased Reading Comprehension – Increased lighting levels are achieved with LED in relation to yellow vs white light resulting in an increased reading comprehension. Improved Light Direction – More illumination on working surfaces are achieved with LED’s ability to provide fully directional down lighting. Better Sleep – Full spectrum light only provided by sunlight and LED lighting triggers our 24-hour cycle (circadian rhythm) by hormonal response which is important to mental cognition. Better working Environment – Both children and teachers benefit from a much greater working environment with LED Lighting. Financial Savings – The simple switch to LED can result in thousands or even tens of thousands of pounds saved each year. Reduce Lighting Maintenance – A much longer lifespan than traditional lighting (50,000+ hrs) resulting in almost eliminating lighting maintenance. When it comes to the classroom and the overall benefits compared to traditional fluorescent lighting, switching to LED lighting is the best choice for schools who want to provide a safe, healthy and green environment for their students and teachers.